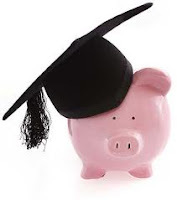 What Makes A Money Smart Student? So what is it that makes a Money Smart Student? I've been asked that question a few times. There are many other PF writers who have their own opinions, and I respect that. There are some who argue that doing the things I talk about on this blog don't make a difference. They say that saving a few bucks here and there takes all the fun out of living the college life and doesn't add up to much in the long run. I've already discussed the numbers in a previous post (Do The Small Things Really Matter? ), so I won't belabour the point here. Being a Money Smart Student, or young adult, isn't just about saving money when you can by doing the little things. It's about having an overall knowledge of money matters, staying connected to your own finances, and having a plan for both during, and after, school. In this day and age, it is easier than ever to find out everything you need to know about money. How to make more money, how to spend less on anything and everything, how to save money, where to save your money...the list goes on and on. I will once again throw out there that the Wisebread website is one of the best resources I've found when it comes to money. Not only do they have their own posts and information - they also maintain a list of the best PF blogs available. You can even search by different categories to find whatever specific money issue you need. It's a great place to start to get informed about handling your money. Having at least a basic understanding of finances will help you many times over in the long run. Along with having a general knowledge, it is even more important that you have an in-depth knowledge of your own finances. How much you have, how much you need, where it's going to come from, how you can bring in more - you MUST be constantly connected to your own personal finance situation. Losing touch was one of the main factors in my financial demise years ago. If I had stayed on top of my money I know I could have worked my way through the hard times and avoided the disaster which ended up taking place. This is, in my humble opinion, the most important aspect of being a Money Smart Student. Know your own financial situation better than anything else. If you know where you stand, you can handle the hiccups along the way much easier. Finally - have a plan. Don't wait until the end of the current school year to plan for next year. Get your FAFSA paperwork done early if you are an American student. Don't leave it until the last minute. As you near the end of your education, start planning for life after college. As you enter the workforce, what is your plan to save some money for when you have a family? Thinking a step or two ahead of wherever you are at the moment will make it easier to adjust things along the way. I don't want this to sound too preachy. I just want you to understand that it takes a bit of work to be completely Money Smart. Knowledge is power, as the saying goes. Educate yourself about money, push yourself to stay connected to your financial status, and think ahead. These are the building blocks to being Money Smart - not just as a student, but throughout your entire life. Cheers! What steps are you taking to stay 'Money Smart'? What else do you feel is important for students, or young adults, to know about finances? I would love to have your comments. For those of you who have been living under a rock for the past few weeks - the Super Bowl is being held this coming Sunday in New Orleans. It's the annual super-party as people cheer for a team they usually could care less about during the regular NFL season - but you have to pick one team or why bother watching. As a student - or young adult - preparing for the game, there are a few things to keep in mind so you don't blow the budget for one half-day of partying. The best bet is to organize a bunch of friends, find the one with the biggest television, and have a Super Bowl house party. Everyone can bring their own booze (if you are of legal drinking age of course), figure out who's bringing what for snacks and food, and you can get some good Dollar Store decorations to give it a real party atmosphere. Make sure somebody is going to be the deisgnated driver so everyone gets home safely - or make sure the phone number for the cab company is handy. Having a house party is a great way to enjoy the game, enjoy the company of friends, and not pay outlandish prices for food and drink at a bar or restaurant. It's always at gatherings like these that something happens which will become the topic of conversation within your group for years to come..."Do you remember at the Super Bowl party when Bill......."! Millions of people will be enjoying the game from the comfort of their own homes - or at somebody else's home. Have fun! Cheers! With 2013 well underway, I thought it was time to really get moving when it comes to this blog and the entire Money Smart Student programme. To get things started - I'm going to start at the beginning. Why am I doing a student money blog? What makes me think people will want to listen to what I have to say? Where do I see things going down the road? Questions I'm sure every one of you have had...right?! The idea for this programme came to me almost four years ago now. I was actually doing research on personal finance for my own benefit. You see - I used to be an abolute disaster when it came to handling my money. So much so that it eventually led to bankruptcy and the destruction of my, and my wife's, credit bureau. I'm happy to say that all the bankruptcy stuff is now off the bureaus and we have done a great job, together with a very caring Credit Union Manager, in rebuilding our credit scores. So I was looking for some good advice to move forward with our money handling when I found out some very interesting information. Some of the experts were blaming the housing bubble burst in the United States on an uneducated population. Not uneducated in general - but specifically - financially. Some said that if the 30 and 40 year olds had actually known how to take care of their money, stayed away from high ratio mortgages, and done more to keep their spending in check, a lot of the problems faced by millions of people could have been largely avoided. chapter of my book which shows most parents don't feel qualfiied to give their own children financial advice. That's where the idea for Money Smart Students came from. A desire to try and help fill the void in PF information students need versus what they are receiving. I entered this knowing that I didn't know all the answers. I try along the way to pass on things that I have learned, resources that I've found, and anything else I hope will help even a small handful of students be better prepared for life on their own. Last year I learned a great deal about this whole blogging business. Attending the Canadian Personal Finance Conference allowed me to connect with some of the best in the PF blogging world. I am actually working on switching this entire website over to a Wordpress based blog - but the learning curve is steep so give me a little time to get that done. I work a full-time nights job in the gaming industry (so I sleep the better part of each day away), and I have three teenaged boys and a wife who require my attention, but I make the commitment right now to you, my readers, that I will be posting more often and more regularly in 2013. I have some ideas on where to focus, and how to mix things up a little. I will be working hard at growing our small Facebook comunity into a bigger one and will be utilizing Twitter and LinkedIn much better to try and expand the reach of the Money Smart Student programme. My hope is that you will come away from reading each post with at least one little piece of useful information to help you be Money Smart - Student or not. Until next time - Cheers! Well - you're 17 and now that the hustle and bustle of the Christmas season is over I thought I'd send you this note. It's not about the birds and the bees - I promise! But it is a few thoughts for you in one specific area of your life - money. I hope, first and foremost, that you know that no matter how much I bug you about your finances, I'm doing it with love and concern that you don't head down the same path I did when I was younger. I can't tell you enough how being in control of your money will make the rest of your life so much easier. You'll be able to go places, see and do things, and eventually take your family anywhere your heart desires. We've done pretty well as a family so far - but there is so much more I know we could have done had the money been set aside in the first place. Regardless of what you decide to do after high school, don't mortgage the next 15 years of your life to pay for it. If you have to work for a year or so to save up some extra cash - then do it. You can - gulp - live at home, as long as you need, so you can start off on the right foot when you do eventually head out on your own. Your Mom and I will put up with a few more years of your messy room to make sure you can financially handle life on your own when it happens. I understand there's a young lady in the picture right now. Great! That other talk happened a long time ago so I have no worries there - sort of. As much as you might be tempted to buy her affection, or anyone else's in the future, know that being a gentleman, paying for her dinner and movie ticket, and just being yourself is the surest way to find out if she likes you for who you are - not what you can give her. Don't get me wrong - a really nice birthday, Christmas or whatever gift can never hurt a relationship. Just make sure you plan ahead, save the money and listen to her to get ideas of what she might want or need. You will find out through experience that it's not always the biggest gift that wins her heart - but the thoughtful gifts that show you actually know what she likes and needs. I could go on and on about money stuff like this - I do this on the internet, and wrote a book, you know!! But for now I just want to say that I will always be there for any questions you might have about money. If I don't know the answers, we will find them out together. You have so many opportunities in the years ahead. Be smart with your money and the world can be yours!